Preheat oven to 425°F with a sheet pan inside. Pierce each potato with a fork. Rub them with 1 Tbsp. evoo and salt. Place potatoes on the sheet pan in the oven for 20 minutes. Combine honey, mustard, 1 Tbsp. evoo, salt and pepper in a small bowl. Season the chicken generously on both sides with salt and pepper. Add to pan in the oven and roast for 20-25 minutes, until chicken begins to brown. 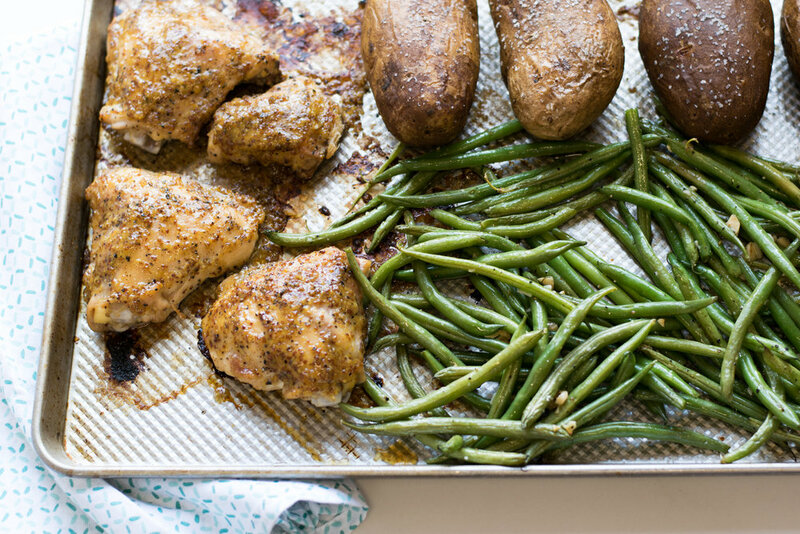 Toss green beans with remaining evoo, garlic, salt and pepper and spread on sheet pan next to chicken and potatoes. Brush honey mustard sauce over chicken. Return to oven and roast another 15 minutes until chicken is cooked through and green beans are ready.